*PLEASE NOTE SKILL CHARTING IS DONE AT ALL PROKICKER.COM EVENTS. (SKILL CHARTING IS EVEN AN OPTION DURING PRIVATE INSTRUCTION SESSIONS). Whether seeking guidance for the first time, trying to win a starting position on a team or pursuing a college scholarship, our two-day instructional camp is a crucial step in becoming self-reliant while in pursuit of athletic goals. At every training site all across the country each athlete receives one-on-one attention allowing him to develop his very own personal talents. Every athlete is individually charted to determine "baseline" skill level and to track personal progress. This information not only provides a measurement of development, it also provides each athlete a tremendous opportunity to "raise the bar" on skill performance, set goals and continually improve his "ranked" position. From beginning to end, every step of the way, our innovative training program is designed to teach each athlete the fundamentals and techniques that allow him to learn to coach himself. Our professional coaching staff guides participants through a skill-learning process where every experience has a purpose. This allows each athlete to identify personal needs, develop individual skills, and at the same time create a blueprint for practice and improvement. Our Academy is the most comprehensive kicking, punting, and long snapping instructional camp in American football. The second day of our Academy includes an in-depth review of the individual skills and fundamentals taught on the first day. Training begins by developing these same techniques in a systematic order that matches the sequence in which the skills are executed in games. This not only promotes faster skill improvement, it also enables a much deeper retention of learning. Kickers, punters, and long snappers are provided the opportunity to train and advance as their individual skills continue to improve. Teaching "snap-to-kick" instruction is crucial to skill development and separates our program from all the others. Such an approach enables each athlete to effectively learn how to transform individual practice routines into game-day performances. More importantly, every athlete will gain a valuable learning experience through drills simulating the pace and pressure of an actual game! Skill charting is done at each camp to track individual progress. By personally charting each athlete we are able to establish skill level, determine individual needs, develop a personal "plan of action," and provide guidance to setting goals as skills develop. Learn flexibility drills for specific development of kicking, punting, and long snapping skills. Learn step-by-step "self-coaching" techniques that will become your own "blueprint" of practice and improvement. Be individually filmed and analyzed using our innovative video-analysis system for immediate visual learning. Advanced review of individual techniques to promote faster skill improvement and deeper retention of learning. Learn fundamentals in a systematic order that matches the sequence in which the skills are executed in games. 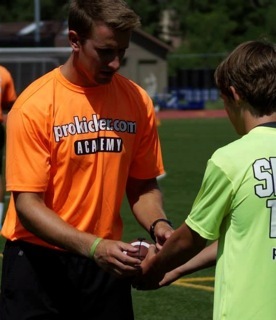 Accelerate skill development through "snap-to-kick" instruction. Develop strategies to incorporate "timing" into your practice routine. This is the "silver bullet" that transforms skill development into game-day performance. Learn the secrets of "coming through in the clutch" and build a mental plan into your workout routine. Learn strength training and flexibility drills for specific development of kicking, punting, and long snapping skills.